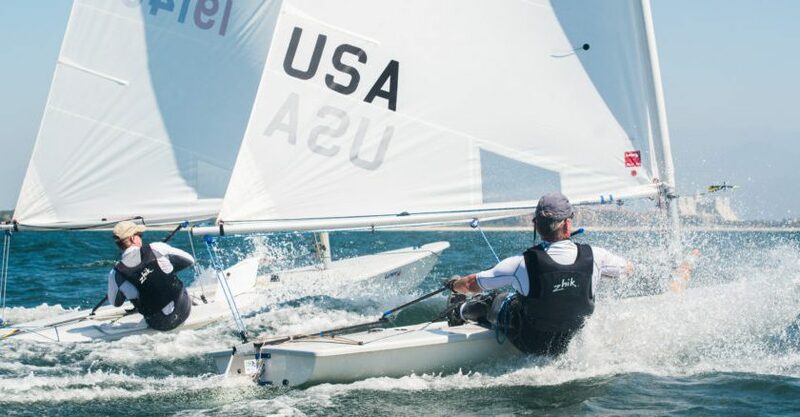 This is one of the most advanced techniques in Laser sailing. The first time I heard the phrase I was at the midwinters east regatta. A sailor came up to Australia’s Brendan Casey, who owns the sailing apparel brand, SEA (Sail Equipment Australia) and asked him how he won 3 races on the last day to take top of the podium. I believe his response was something like, “I just put the bow down, mate.” At the time, it made sense to me that he was bigger and stronger, so he must be able to sail lower angles than close hauled (low mode), and that because he was going so much faster, he made up for the extra distance. As it turns out, that was exactly right. But I’ve since learned that it’s not only power and weight, but clearly a technique for accelerating the boat beyond what your competitors are capable of. When is bow down effective? It is the most advanced point of sail in a Laser, not many people in the world can make it work effectively. If you’re good at it, strong and fit enough, it can replace VMG, but requires a fresh breeze to not slip sideways. The best conditions to use bow down effectively are shifty, because you can cover more distance to the next shift, reducing leverage on sailors that have split from you or creating more leverage by separating yourself from the other sailors. How much lower is it? No more than 5 degrees usually, but it will range depending on your strategy. It is the most exhausting thing to do correctly, and if you do it incorrectly, it’s even more tiring. You will be required to hike harder, for longer, and if you get tired, your boat will slow and it will hurt you even more. I would only recommend this if you’re completely confident in your ability to sail fast VMG, (Velocity Made Good) which is what I will use to describe close hauled course. How much space do you need to go bow down? Lots! If you want to effectively sail a lower angle than the boats around you, you need space to leeward to give you room and account for some inevitable side slip. Have you ever tried rolling over someone, and they end up pinching you off? Why do I side slip every time I try to go low? You’re simply stalling. If you wish to maintain flow over your foils and sails while sailing lower than close hauled, you had better make sure your apparent wind angles are VERY far forward, in other words, you need to be going extremely fast all the time. As soon as you slow a tiny bit, your apparent wind will go aft and your trim will be stalled, and your boat will have weatherhelm – sending you sideways. So what do I do differently to make sure I’m fast? The initiation is the most important part. Picture this: You’re going close hauled, mainsheet at block to block setting on VMG mode, and you suddenly wish to go 5-10 degrees lower. You steer the bow down, but have not yet accelerated, so your apparent wind is way aft. In order to accelerate, you must drop sheet up to 5-6 ft out in really windy conditions, usually 2-4 ft in medium winds to hit your proper trim angle. Torque out and back to flatten the boat and you will begin to accelerate. As you continue to accelerate, your apparent wind will shift forward again, and you can begin to sheet in slightly. Now that I’ve accelerated, how do I maintain low mode? Once you are down 5-10 degrees from close hauled, you MUST never come back to close hauled. Keeping control of weatherhelm and waves are absolutely crucial. Any little bit of weatherhelm, and it’s over. Let me explain… What is weatherhelm? When your boat wants to head up. What is the major contributor? When your boat slows down and you get leeward heel, your apparent wind moves aft, your boat will want to head up. So why can’t I just use my rudder to make sure it doesn’t head up? Pulling on your tiller to keep your bow down for more than the distance between 2 waves or chop will cause the boat to slip sideways at an alarming rate. The rudder needs to be weightless in order to maintain proper flow and speed. Likewise, proper flow and speed are essential to keeping your rudder weightless. What should I do instead? Use your mainsheet to trim to your apparent wind and body weight to keep the boat constantly flattening. And finally, what is the correct timing? Sheet out as your bow dives into a wave, and torque or hike harder as your boat crests each wave. Limit the use of your rudder. Why does this hurt my legs so much? Weatherhelm hurts.. A boat going slower is harder to hike than a boat going fast… If it’s fast, your apparent wind is forward and it means there’s less pressure on the sail.. If the apparent wind is aft, you are fighting more pressure in the rig. Try to remember this all of the time when practicing in windy conditions. How do I practice this technique? 1. Try it on your own. Do spurts of 1 minute on, 30 seconds off and during the 30 seconds you are not resting, your sailing VMG. 4. At the end of the day, there are few ways to exert yourself more on a laser. Tom Slingsby accredits his hiking fitness to practicing going low mode, because it will make close hauled feel easy.